Back during Don Johnson’s burst into stardom on NBC’s Miami Vice, ABC’s Dynasty also roamed the earth as the 1984-’85 TV season’s No. 1 prime-time series. Now they’re both back in ABC’s Dynasty-like Blood & Oil, with Johnson as tycoon Hap Briggs. In the rollicking premiere episode, he gets to both disown his no-account son and throw off lines like, “This plot’s been drilled harder than a Tulsa whore.” Yes, Johnson’s likely having a very good time while also cutting himself a further piece of the financial pie as one of the show’s executive producers. He can still fill the small screen, too. Not that Big Don ever had any doubt of that. 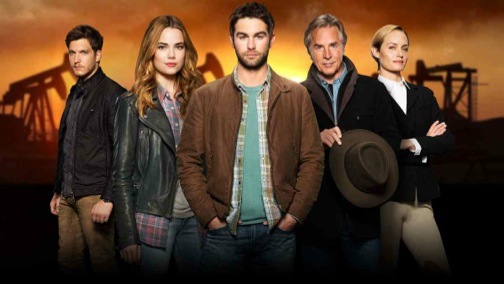 Blood & Oil otherwise is the saga of Billy and Cody “CJ” Lefever (Chace Crawford, Rebecca Rittenhouse), who have the grand idea of starting up a laundromat chain in the great unwashed state of North Dakota. But Billy’s not the most attentive driver. So he doesn’t see two vehicles blocking the road up ahead until it’s too late to stop the Lefevers’ washing machine-packed pickup from flipping off the road. While it’s airborne, the series flashes back to their farewell party back home with friends and investors. Then comes the crash landing, leaving the cargo all busted up while Billy and CJ emerge intact, hitch a ride and wind up in the wild ’n’ crazy town of Rock Springs. A savvy bar owner named Jules Jackson (India de Beaufort) offers them a tip on some ramshackle lodging before there’s a ruckus outside. It turns out that Hap’s son, Wick (Scott Michael Foster), has just enraged a group of native Americans by killing one of their “spirit animals,” a white moose. Delroy Lindo, in his only scene as the town sheriff, fires three shots in the air, restores order and then orders everyone to go back to their drinking. Lindo presumably will have much more to do in future episodes. Johnson’s Hap is first seen having it out with his son again. “I guess I”m not current on my native superstition, pops,” he sneers, wondering why the old man isn’t proud of him for bagging a trophy animal. “The next time I’m proud of you, Wick, it’ll be the first time,” Hap rejoins. It goes downhill from there, with the bad seed son eventually going too far when he wrecks an expensive piece of oil equipment and then tries to jump Hap from behind. “You don’t deserve to be my son!” Hap thunders after easily subduing him. Furthermore, Wick is “cut off” from daddy’s piggy bank. Blood & Oil soon comes down to a very valuable parcel of land currently owned by a crusty old rancher (guest star Barry Corbin). It’s the gateway to oil riches almost beyond belief. But through pure happenstance, the Lefevers also get wind of it and dirt poor Billy comes up with a financial stake almost quicker than Hap can down a shot. But who’s gonna get there first? And when will Johnson come on-screen again to keep this thing at least halfway interesting? Well, the play’s the thing in this one, but Johnson is the hammer and tongs. At age 65, he still seems up to the challenge of stirring up this little petroleum potboiler. The kids are all right but he’s the man.